How come he can take up the whole 2 minutes and I can't think of enough to fill 30 seconds? How come they give me a blankey instead of a eucalyptus tree? (background) Great. 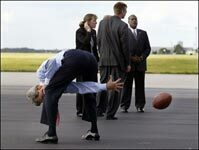 Can you imagine what he's going to do with the nuclear football?